Elegant and stunning pearl and crystal "Y" necklace. 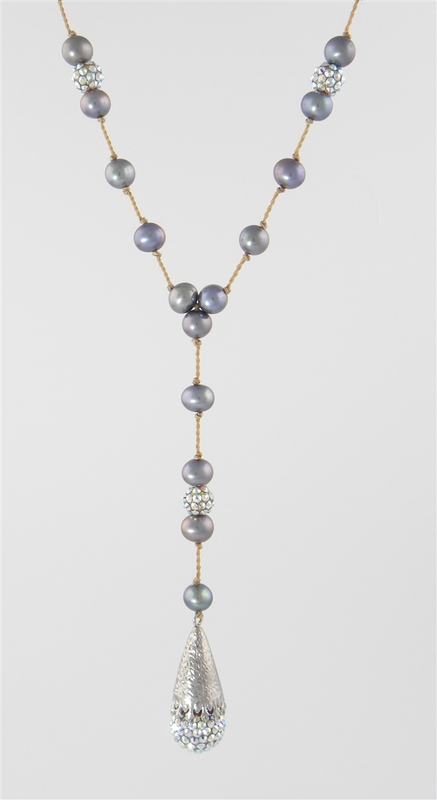 Each pearl is knotted by hand by Emily Austin using nylon cord for strength dyed to match the skin so that you will focus on the pearls and not the cord. The necklace consists of pearls and pavé crystal balls finished off by a sterling silver or vermeil cone with a 10mm ball. The necklace has a 2" extender chain to adjust the length. (The length of the necklace does NOT include the piece that extends from the 3 pearls shaped as a triangle. )You will receive many compliments on this necklace!